The Vinyl Show - laura dunn ART Work Live with ART~! 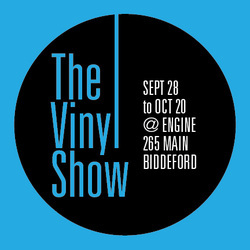 Get on your groove at The Vinyl Show, featuring work made from vinyl albums by 25 Maine artists. Steve Kelly will be spinning records during the evening. John Jennsion, Laura Dunn, Lin Lisberger, Mary Pennington, Michele Caron, Mike Libby, Nancy Keenan Barron, Leticia Plate, Patrick Plourde, Peter Bennett, Rachael Eastman, Sarah Baldwin, and Sunday White. Curator and artist Amy Ray intercepted a hoard of hundreds of record albums at a local thrift store with no intent of spinning them. Instead, she and Tammy Ackerman, director at Engine, distributed them to a diverse group of sculptors and painters. The artists were asked to use the vinyl records as their main material in creating works of art. Anybody listening to music before the age of CDs and iPods most likely recalls the intimacy of handling vinyl discs with a deep nostalgia. Artists were given free reign to respond to the vinyl discs and have come together with a dynamic and inspiring body of work. Some works refer to specific album memory while others seem inspired by the physicality of the black orbs themselves. Thanks to Eternal Otter Records, The Vestry in Monmouth, MusicPlus in Biddeford, and WMPG Community Radio for media support. The exhibition runs until October 20.